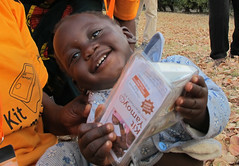 Seven months ago, when we started the ColaLife trial, nobody knew what a Kit Yamoyo anti-diarrhoea kit was. So the first 6 months of the community-based marking activity has been about awareness raising and the launch of a completely new product (Kit Yamoyo) into remote rural areas of Kalomo and Katete. 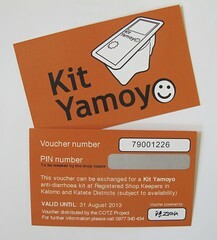 A key tool to help us with this has been the Kit Yamoyo voucher. 1. They ensured that there was a demand for the kits in the remote rural communities so that we could test our hypothesis: if you can generate a demand for a product and make it profitable to fulfil that demand the product will get there, through existing supply channels. With more than 20,000 Kit Yamoyo sales in six months, I think we can claim to have proved this hypothesis. 2. They enabled mothers and care-givers to try this new product for the first time at no cost. Vouchers were a key part of the marketing done by community-based promoters during the first 6 months of our 12 month Kit Yamoyo distribution plan, but we stopped releasing any more vouchers on 31 March. This means that our approach to marketing needed to change. We had thought long and hard about this: how would the promoters encourage our remote rural customers to buy, without the incentive of the vouchers? 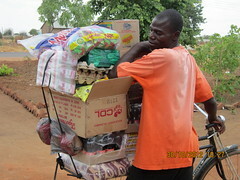 Our replacement ‘secret weapon’ is our existing customers: the mothers and carers who have used the Kit Yamoyo. Now, when promoters speak with a group of mothers in our target communities, there will be at least 3 or 4 women who have used Kit Yamoyo. As far as we know, they have all had positive experiences. Word of mouth is the most positive marketing force in these rural communities, and these women are our product advocates. Our promoters will be identifying these women in the groups they meet and will be inviting them to tell their peers about Kit Yamoyo and what did for their child. We believe that this approach will be very effective – it chimes well with ‘Bottom of the Pyramid’ good practice. But as ever, we will be able to measure this as the trial progresses. As well as a change of promotional strategy during face-to-face events, we are also improving advertising and branding at the retailer level. At the start of the trial we used paper posters. These looked very attractive but a lot of shopkeepers put them up outside their shop, and they did not stand up very well to the wind and rain. So, for Phase 2, we have gone to the expense of printing the posters onto ABS board. These were produced locally to a very high standard but the supplier forgot to drill the corners. 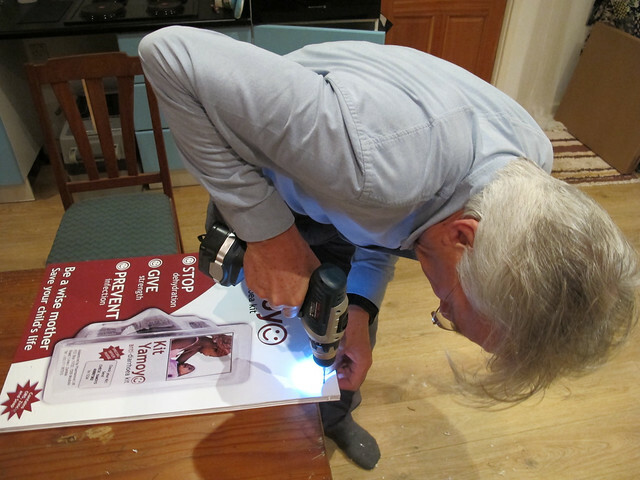 So: it was back to the kitchen table, where so much ColaLife development has taken place over the last 5 years! Colalife is the model for others to follow. Testing theories in practice, listening to what the customers are saying and using relevant publicity to get the word out. Curious if you have use radio interviews to explain what you’re doing. Does everyone understand English in that part of Zambia? Thanks for your comment Jonathan. We are using radio broadcasts in one of our districts so far but they are in the local language on a local language station.